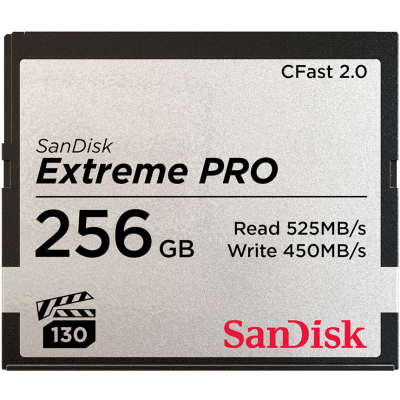 The SanDisk Extreme PRO® CFast™ 2.0 memory card delivers the high performance that broadcast, cinema, and photography professionals demand today. The card has the speed, capacity and performance needed to record cinema-quality 4K video (4096x2160p)1. It delivers write speeds of up to 450MB/s* and data transfer speeds, up to 525MB/s*. With a video performance guarantee of 130MB/s (VPG 130)*4 and 128GB to 256GB** of storage capacity, this is a great memory card for professional cameras and camcorders. With Video Performance Guarantee-130 (VPG-130), the SanDisk Extreme PRO CFast Card lets you capture uninterrupted cinema-quality 4K video*1. VPG-130 guarantees a minimum sustained write speed of 130MB/s to keep up with the latest professional video cameras. The card comes with a RescuePRO Deluxe data recovery software download offer*3. This software makes it easy to recover files that have been accidentally deleted. * 128GB - 256GB: Up to 525MB/s read speed; Up to 450MB/s write speed. 64GB: Up to 525MB/s read speed; up to 430MB/s write speed. Based on internal testing; performance may be lower depending upon host device. 1MB=1,000,000 bytes. 4. Video Performance Guarantee enabled to support cinema-quality 4K video recording at 130MB/s minimum sustained write speed.